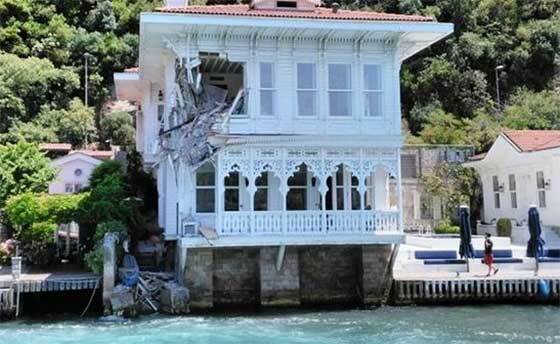 The Bosphorus Strait has been closed to transit traffic after a cargo ship ran into a villa in the Anadolu Hisari area, Istanbul, Turkey causing substantial damage. The dry cargo ship, identified as the Sierra Leone-flagged Majed and Randy, struck the second floor of the Ottoman era mansion, due to rudder malfunction at around 1 pm today. The 1980-built ship of 6,476 tons was heading from Istanbul to Beirut when the incident occurred. Based on images of the Turkish Coast Guard, the front of the ship was slightly damaged. "There was no pilot on board and coastal safety employed immediately two tugs and pilot for assistance. No casualties or pollution has been reported. The vessel remains anchored at the same area," GAC informed. The Strait was due to re-open at 15:30 hours, according to GAC.